This new adventure cruising around the Galapagos is a great alternative to the typical tour in the Galapagos. The Valkiria offers options not usually offered on other cruises. We combine the natural wildlife of the Galapagos islands (such as swimming with sea lions, observing blue footed boobies or frigate birds nesting areas and incredible underwater life while snorkeling) with other unique options on many of the islands. Built in france, this beautiful Privilege designed by Philippe Jeantote is a charming sail catamaran for cruising around the Galapagos in style, this beautiful yacht accommodates 10 guests in 5 large double cabins with full size beds each with toilets and showers, indoor and outdoor dining areas, full navigational equipment which features all US and EU communication and safety required electronics, a solar panel which makes it completely ecological with all instruments and systems working on battery. The S/C Valkiria is the perfect choice for a luxurious trip in the Galapagos. 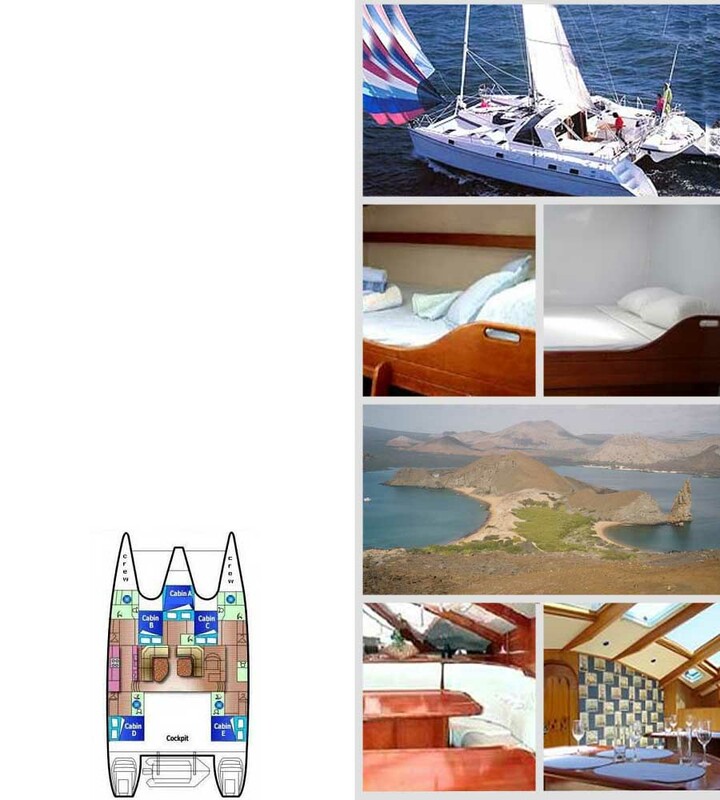 Whatever you requirements are sailing, surfing visiting all ports or just relaxing, Valkiria is your choice. This new adventure cruising around the Galapagos is a great alternative to the typical tour in the Galapagos, finally new options have been opened and new areas that were never visited before are available during this cruise. We combine the natural wildlife of the Galapagos islands such as swimming with sea lions, observe blue footed boobies or frigate birds nesting areas, incredible underwater life while snorkelling. Visit the top of volcanoes most of which are still active and took part of the formation of these islands which is not available on any regular cruise, all this plus the unique experience of seeing how the human population in this islands live and interact with nature in harmony, learn how people arrived, how they survive and what locals do in Galapagos. Our operational days are flexible and we can start any day of the week and adjust to your requirements.